Thomas Hardy’s Ale | Beer Apprentice - Craft Beer News, Reviews, Interviews and Info. Hello once again good craft beer people. For today’s craft beer review I’m going to trying my first ever Thomas Hardy’s Ale (2008 Vintage) produced by the O’Hanlon’s Brewery Company Ltd. located in Clyst St. Lawrence, United Kingdom. I’ve been hanging on to this beer for some time now and I just couldn’t wait any longer. I’ve heard that these brews will age up to 25 years (and even longer in some cases), so I hope this thing still satisfies my expectations by opening it a wee bit early. I had a bit of trouble finding any kind of commercial description of this beer on the website, ohanlonsbeer.com, so I reverted back to ratebeer.com for some insight. Scarce, subtle and complex, Thomas Hardy’s Ale is the beer enthusiast’s equivalent of rare cognac. Bottle-conditioned to mature in the bottle like fine wine, this old ale/barley wine will improve with age for at least 26 years (and we’re still counting!). Not for the faint of palate, especially when young and brash, maturity brings an elegance of flavors unmatched by any other beer—if you have the patience to cellar it for at least a decade. Well, I couldn’t wait for a decade to pass, so I’m going to go ahead and drink it. This bottle is #’d T22954. It comes in an 8.5 oz. bottle and has an ABV of 11.7%. The beverage poured a dark amber to burgundy color that was predominately cloudy. The collar was light tan and of decent size. It was of a smooth and creamy texture. The retention time was quite good for such a high ABV beer and the lacing was very nice too. It was thin, but it hung around for a long time. Some gorgeous alcohol legs were seen on the sides of the snifter as well. A beautiful looking beer to say the least. The aroma was outstanding. Deep, dark, booze infused raisins, figs and plums. Sugary molasses mixed with toasted breads and toasted biscuits. Some woodiness hid underneath and a bit of tobacco contributed a distinct earthy and herbal component. It was superbly balanced and even. There’s no mistaking…. a “world class” fragrance with this one that’s for sure!!! The taste had tones of a syrupy sugar coalesced with more dark fruits of raisins and figs. A hint or two of booze (rum) along with more wood and a touch of leather consolidated with a minute tobacco savor. Honestly, it wasn’t quite as robust or rich as I was expecting it to be. It was still very nice and even, but it lacked a bit in regards to that “wow” factor that I’d heard so much about. The mouthfeel was medium bodied. It was very smooth, chewy, sticky and dry. The carbonation was a touch below average and the warmth was not as forceful as I was hoping for either. I was anticipating a strong burn, however I never received it. Oh well. Enough flavor was left behind on the palate to please me anyhow. Overall, I thought this was a very, very nice beer, obviously. I probably should have let it age a bit longer however, but like I said, I just couldn’t wait for another second. It just kept staring at me saying, “drink me now!! !” I’d love to find another bottle somewhere. Maybe of an older vintage to see how the complexities really develop. One thing is for sure, I love these English Barleywines. That strong malt really appeals to my nature. The smell of this beer was “top of the line” and I thoroughly enjoyed the flavor. It was surprisingly easy to drink, however I would still classify this as a sipper. A brew to sit down with, relax and contemplate. 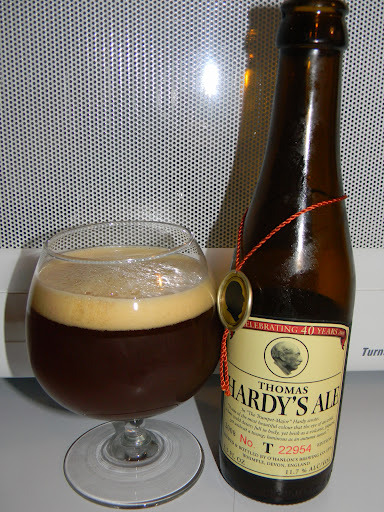 If you guys ever have the chance to pick up a Thomas Hardy’s Ale, I would suggest doing so. They are a tad on the expensive side, but if you can splurge for a bottle and refrain from drinking it for a while, I’m sure that even the most experienced or inexperienced of craft beer drinkers could appreciate the subtleties. Thanks for reading and commenting everyone. I, truly, appreciate it.